Little cute child wearing blue denim sundress has fun trying to feed his mom with marshmallows. Attractive brunette mother and her daughter enjoy a sunny weekend. hd00:16Brunette mom feeds her cute daughter a marshmallow. Happy motherhood and childhood concept. Close-up of little cute girl eating marshmallow from mother's hands in slow motion. 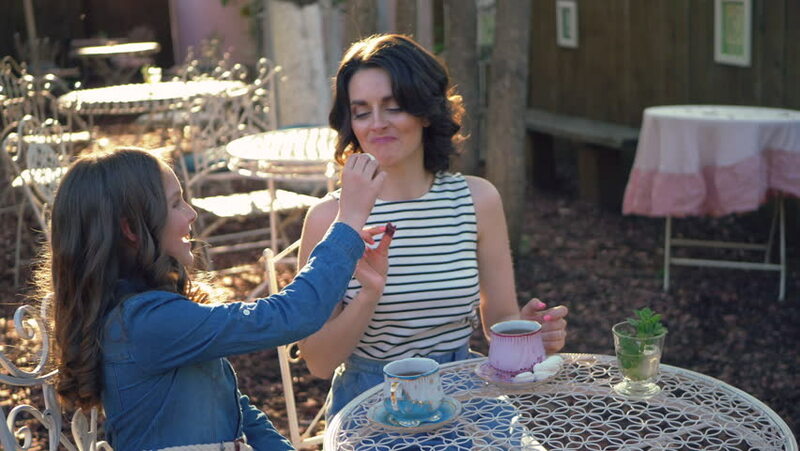 hd00:12Attractive brunette mother is feeding her daughter a piece of marmalade. Happy family is sitting at vintage table in the street. They enjoy a sunny weekend. Two colored cups stand on the table. hd00:09Daughter kisses happy mommy on her cheek while they are spending time in the outdoor cafe. Love, tenderness, friendship between mother and daughter.